Help! I am terrified of what will happen at this thing you call a "341 Meeting of Creditors." Should I just shoot myself beforehand? No! Wait until after you get your discharge. But by then you will be thrilled to be out of debt and won't want to. Many or even most people are terrified by the notion of a "creditors' meeting." The debtor is retstrained in a steel chair, in a dark room with an intense light on just him. The creditors file in one by one wearing hog-head masks with hooded black robes. Electrodes are clipped to the debtor's skin... in my new film called "341-The Number of Terror! " See it this summer! The Trustee will first ask you for your driver's license or state picture ID. He will then ask for your original Social Security Card or proof of Social Security number (original W-2, original Social Security statement or original letter from the government with the number, Medicare ID with the number or other acceptable proof). He or she will then ask you, "have you read the bankruptcy information sheet?," which is usually right outside of the meeting room. Did you sign the bankruptcy documents? Were they true and correct when you signed them? Do you have any additions or corrections to those documents? When did you sign the documents (i.e. the date-this should be the date on the documents)? Did you list all of your real estate? How did you get the value? Did you list all of your personal property? Have you made any transfers of any property, real or personal in the prior four years? Do you have the right to sue anyone now for anything, or are you now involved in any lawsuits? Do you have the right to any money from an estate? If you do, or win a lottery within 180 days months after your discharge, these become property of the bankruptcy estate. How much did you pay your attorney? Was this paid before or after you filed? (This should always be paid before you file). Have you taken the second (financial management) course? If not, you have 60 days to do so. 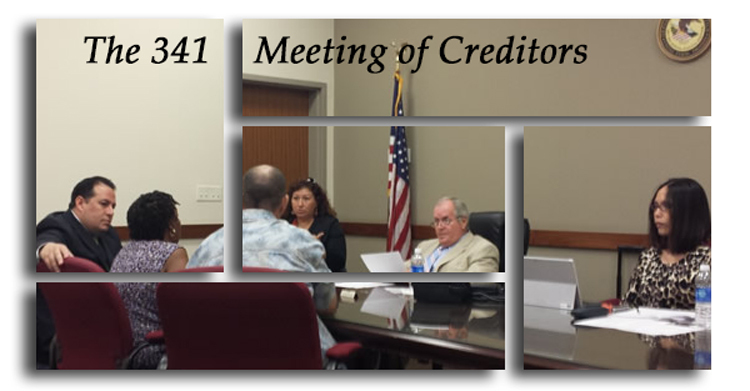 A reenactment (which can be found on YouTube) of a typical creditor's meeting (note no creditors are in attendance-this is normal). The trustee is the man in the middle asking the questions. The woman on the right is playing the lawyer of the person being asked questions. You can see that, unlike court, your lawyer will not ask you questions, and no judge is present. You will also notice that the trustee is not asking the debtor to turn over any property. This video is about the length of an average 341 meeting.